Royal weekends at LeoVegas Casino - cash and free spins up for grabs! Wonderful weekends at LeoVegas Casino! Winter is slowly coming to an end – so LeoVegas Casino is spicing things up with three royal weekends! They come with chances of cash prizes in exclusive tournaments and draws, as well as some Sunday Free Spins! The upcoming weekends at LeoVegas Casino are filled with tournaments, draws and chances of winning! 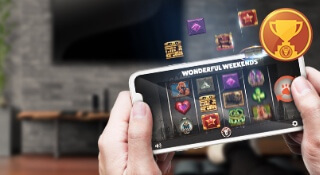 Each weekend will come with tree different events – exclusive weekend tournaments, weekend draws and Sunday free spins. Make sure not to miss out! There will also be Weekend Draws every week – and you’ll get one ticket into the following £5000 draw for every £100 you play through on the week’s tournament game or at Witchcraft Academy. You can collect up to 30 tickets in a weekend in order to increase your chances of winning – and 10 lucky winners will win £500 each every Monday! As an extra bonus, you can also login to Witchcraft acadamy between 12:00 and 16:00 on Sundays to take part of Sunday Free Spins!